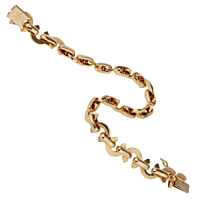 An elegant and iconic charm bracelet from Chanel that features alternating Chanel C motifs in 18k yellow gold. The bracelet is 6 1/4 inches long and will pair beautifully with both casual and formal wear. Versatility and elegance, in the mark of Chanel.